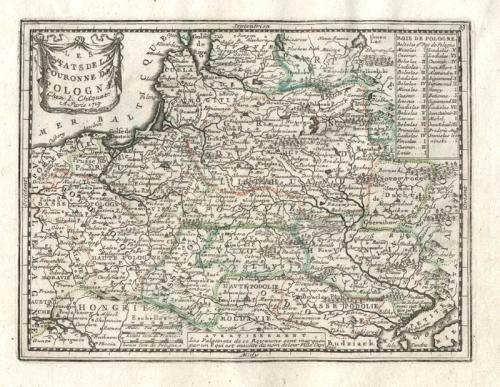 Title: 'Les Estats De La Couronne De Pologne', Paris, 1719, From 'Le Nouveu et Curieux Atlas Geographique et Historique'. An elegant small map of Poland by Jacques Chiquet. This map is quite rare and is noted for the precision of the engraving but it is also interesting for its retention of an older style of decoration at a time when French cartography was at the vanguard of a more scientific approach. This map shows Poland and part of Hungary and Russia. Original outline colour distinguishes the provinces and a panel at the top right lists the names of the kings of Poland. There is a decorative title cartouche at the upper left.